The cruise that I participated on was a multi-part project that spanned several weeks. I came on board for the final, and most interesting part of the project. Those parts you can read about in my log entries, however some background and technical information may be useful to better understand the operation. The cruise took place onboard the NOAA R/V Shearwater. 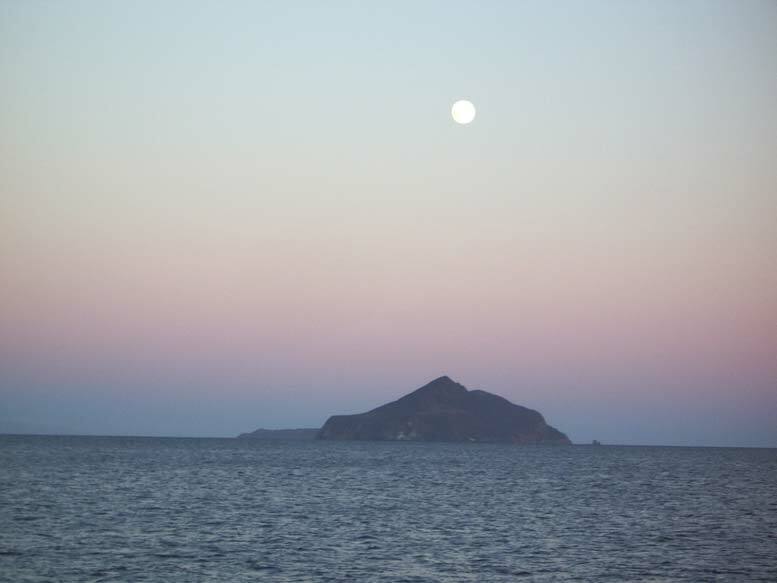 The project was called a Quantitative Finfish Abundance and Exploration of the Channel Islands Marine Protected Areas. 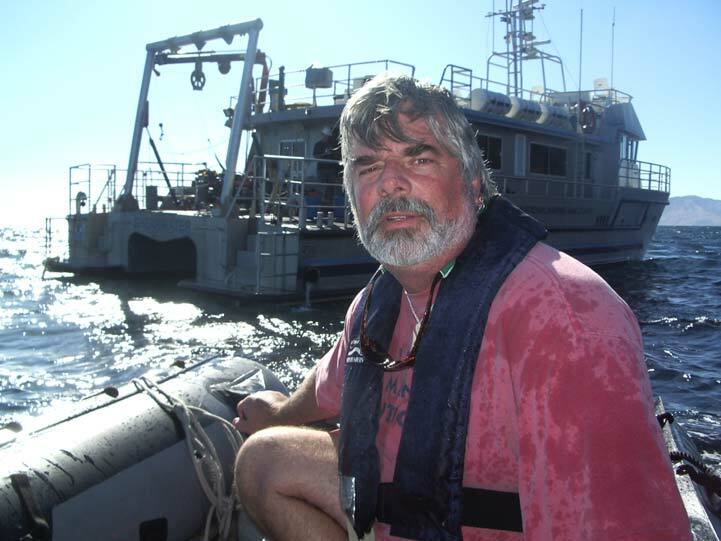 A cooperative Remotely Operated Vehicle (ROV) study with the California Department of Fish and Game, Marine Applied Research and Exploration, and the Channel Islands National Marine Sanctuary. When I arrived, the bulk of the work had been completed and it was time for the experimental portions of the project to take place. These experiments were designed to ensure the reliability, precision, and accuracy of the quantitative data collected by ROV survey. 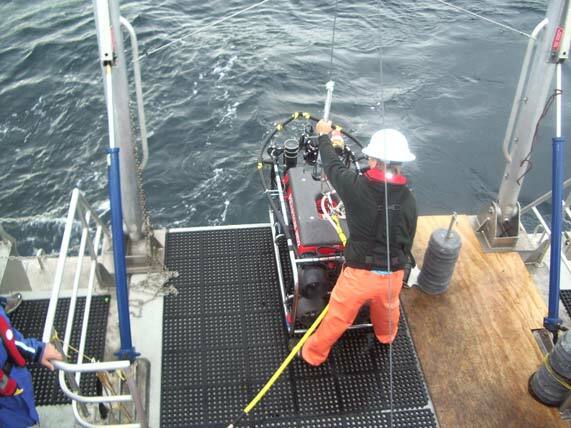 The basic operations involved live boating the ROV along predetermined track lines. That is, the RV Shearwater would proceed along a predetermined line on the surface that the ROV was also independently operating on at the ocean floor. The ROV had a range of 50 meters from the stern of the RV Shearwater. The ROV pilot had on-screen-display (OSD) from the video cameras mounted on the ROV, as well as an OSD that displayed the ROV position relative to the mother ship. This display is generated with the use of a sonar beacon mounted on the ROV and a sonar receiver lowered over the side of the mother ship. Arrive at the R/V Shearwater. Got the lay of the land. 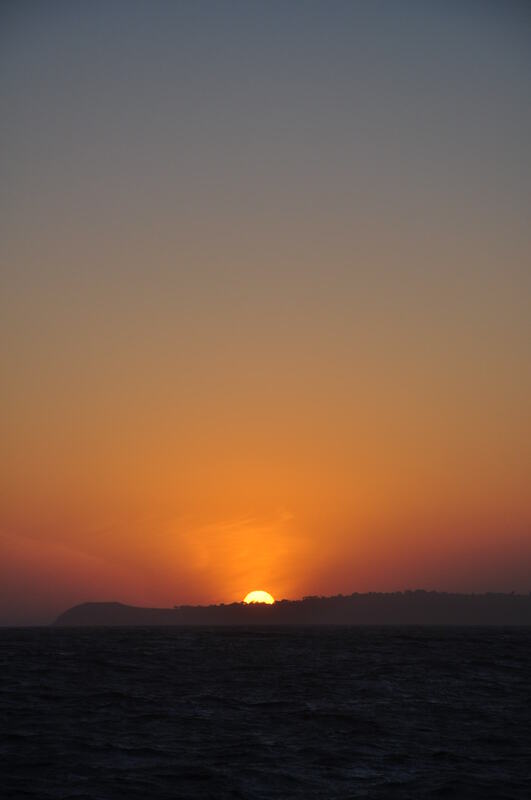 Head out of the Santa Barbara Harbor in transit to Santa Cruz Island to pick up the research crew. With the team of scientists on board, we head out for our destination of East Point on Santa Rosa Island for the first deployment of the ROV. Finally made it to our testing location. Weather was dismal as the ROV was launched. Today’s mission was to “paint” fish with lasers mounted along side the ROV camera. This was a very interesting procedure designed to measure fish length. Essentially capturing a fish on video and “painting” it with two laser dots at the known distance of 11 cm. Total fish length can then be calculated either by determining fish camera fish length and laser dot space, or by using the screen width and the fish length in comparison. This day I became umbilical tender and hydraulic operator for launching and retrieving the ROV. I also observed the underwater video and fish painting process. This was a very interesting day becoming part of the crew and assisting in the work. 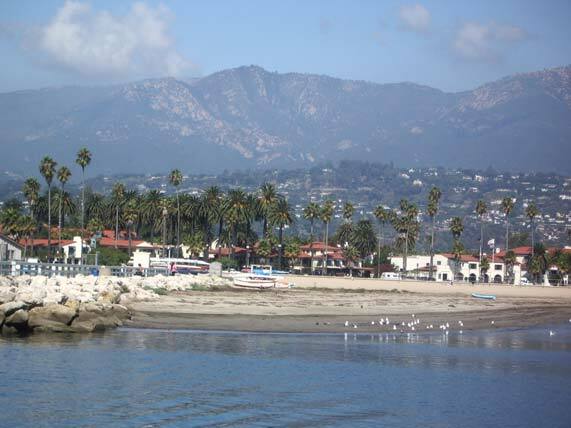 Due to a couple of technical issues, we returned to Santa Barbara for the night. While crewmembers were working on correcting the technical issues, I assisted others with setting up lines for the next set of experiments. 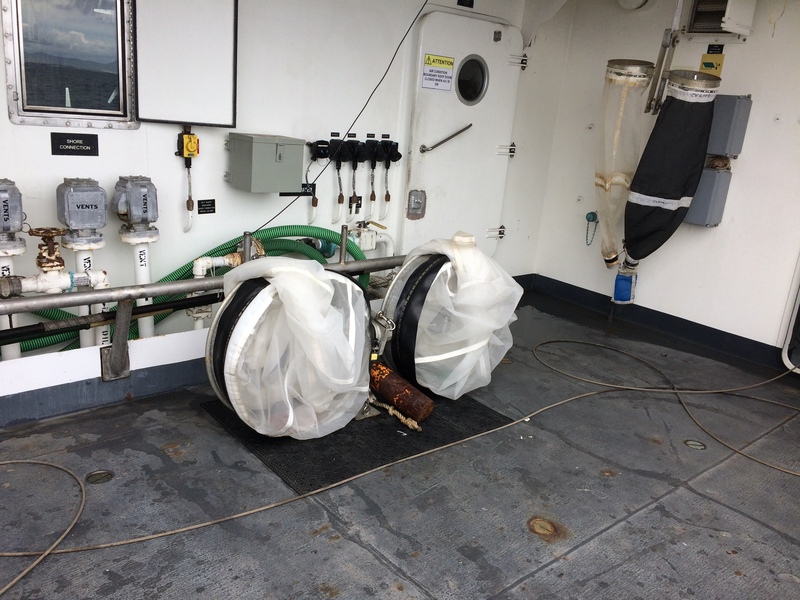 This required setting up vinyl covered steel cables at a length of 110 meters and marking them with colored flags every 10 meters that would be easy to view through the ROV cameras. These cables were also set up with loops on each end for linking together, or for securing weights. The cables were then spooled for ease of deployment and stowed for later use. The technical issues as well were repaired and again we set out to sea. 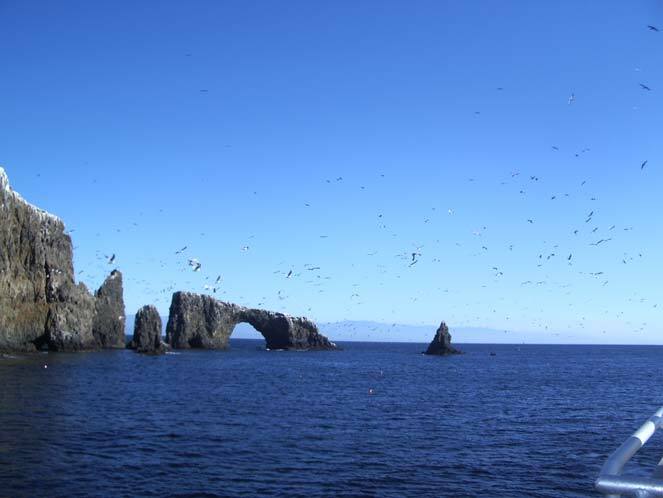 This day’s destination was Anacapa Island. With some sonar scanning, a sight was selected for the next sets of experiments, to determine accuracy of transect distance precision across the spatial dimension. For this experiment, the 110 meter cables were laid across the bottom with high relief profiles. This distance of cable would provide a length of 100 meters to run with the ROV. Divers also swam the line and took depth readings along the cable. The cable ran up and down over rocks and various substrates that are considered fish habitat. The concept being that there were more lineal feet of fish habitat in this relief than straight line distance. The ROV recorded this distance, but this was a means to determine if those recordings were an accurate measurement. The sight we were working was spectacular. We were on the southern tip of Anacapa Island. The shoreline of the island was shear rocky cliffs. The cliffs are a major nesting and roosting sight for the endangered California Brown Pelicans, they were everywhere both on the cliffs and circling in the sky. The area was also populated with sea lions. They were very amusing swimming around the boat and with their barks echoing off the cliffs of the island. After the work here was done, we headed north for a protected cove to drop anchor for the night. 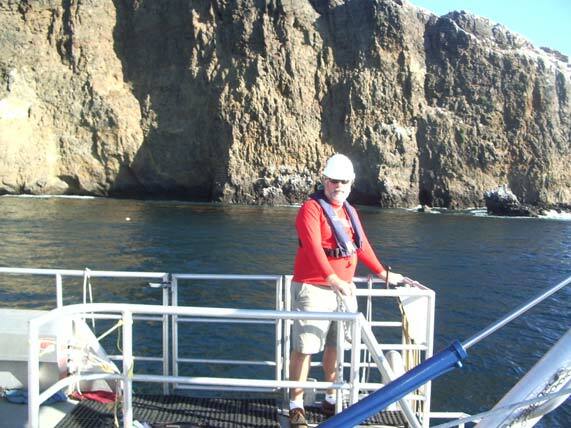 This day we headed back toward Anacapa to continue the track line experiments. Another shallow depth sight was selected toward the North end of the island. The same procedures were used here laying out the cable lengths that were then checked by divers and then run with the ROV. The water was thick with small baitfish that was being fed on by schools of Bonita. This was a sight to see, and was particularly amusing to see the pelicans dive-bombing into the water also feeding on the baitfish. This went on for most of the day. Operations went well today and when complete the gear was collected and stowed. We headed off to another protected cove for the nights anchorage. We continued the track line experiments today. Work was going well so we started preparations for the next upcoming experiment. The preparations consisted of setting up fish models of various sizes and securing weights to then to enable deployment of them floating various heights off the bottom. The fish models were constructed of a flat piece of neoprene with color copied pictures of the local significant fish species laminated and attached to the sides. The sight of the day was a pod of dolphins leaping out of the water and splashing around in some sort of frenzy. We assumed the must have been feeding, but were not really close enough to tell exactly what was going on. Today’s tasks went well and I went out on the Avon to retrieve the cables and the divers. With all back onboard, we headed off to the nights anchorage. Today we set out for a deep water site to continue the track line experiment. The previous sites had been in the 10 to 20 meter depth zones. Today we would run the track line experiment in a 50 meter depth zone. This posed a different set of circumstances. The tracking cable was spooled into a basket for deployment. It was then deployed skillfully and precisely by the well experienced deck officer. With the cable in place, the ROV was launched to run the line. This depth was to deep to send divers down, so the ROV did all the work. Tracking went well and the ROV was brought back on board. Recovery of the gear was a bit more difficult. We had to haul back the cable and weights with a power winch as opposed to winding it back by hand in shallow water. After we got about half of the length back, it got jammed and snapped so fast my head spun. At least the experiment was completed. 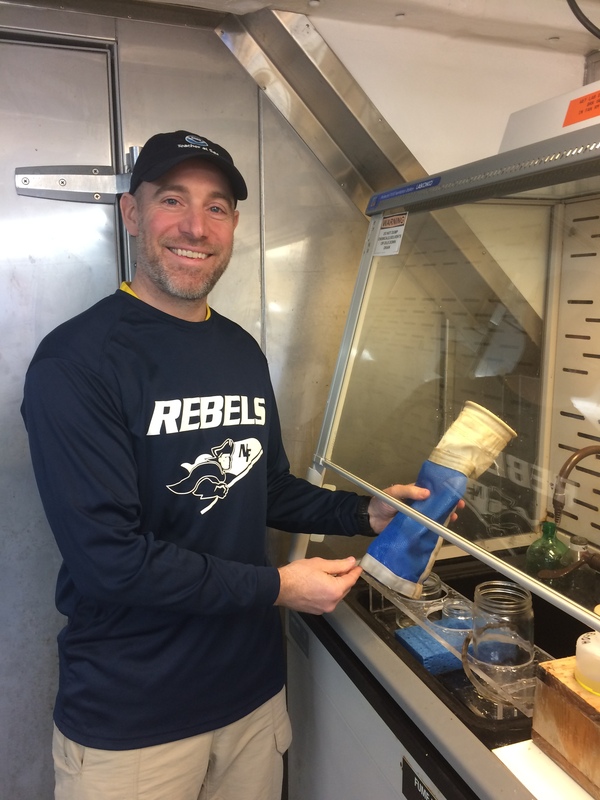 After gathering and comparing the ROV data with the diver collected data it was apparent that the ROV collected nearly identical data to the diver collected data. This experiment seemed to be a success. ROV use and procedures seemed to be a reliable means to determine transect distance across the spatial dimension by my observations. 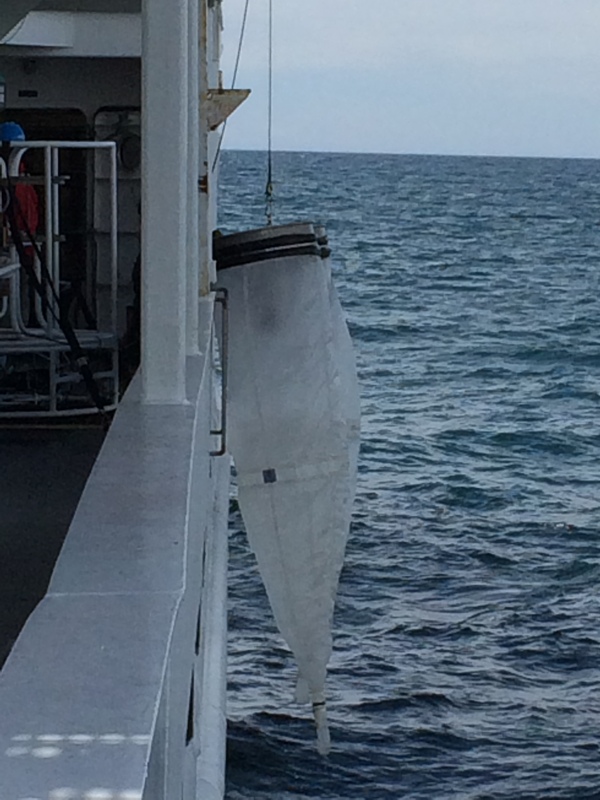 Naturally the collected data would be reviewed later by the scientists on board to accurately determine the results. During the day we continued to prepare the fish models for deployment tonight. With the track line experiments complete, we headed for a location suitable for the fish model experiment. 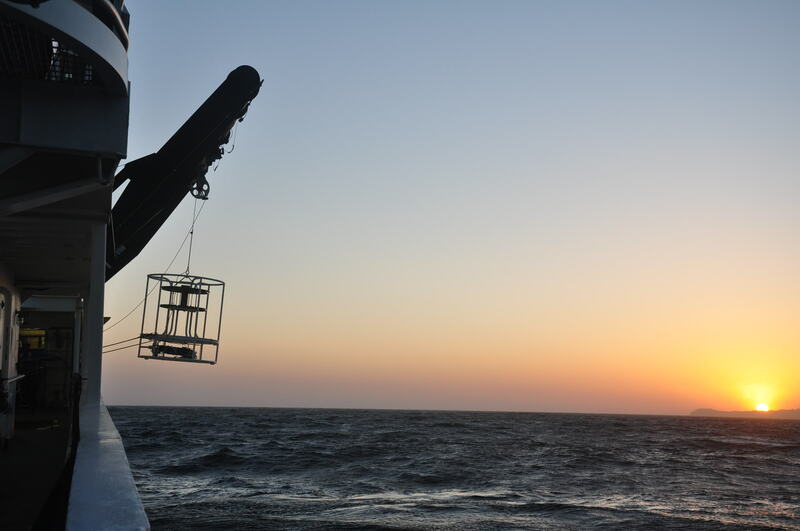 This experiment was conducted in the evening to simulate the light conditions in the typical habitat depth of 50 meters. The point of the experiment was to determine the accuracy of fish length as determined by ROV survey. The ROV survey used both paired lasers and distance sonar to determine fish length. When these procedures are utilized on fish models of known length, the scientists could determine if the process could be accurate when video capturing wild fish in the test zone. 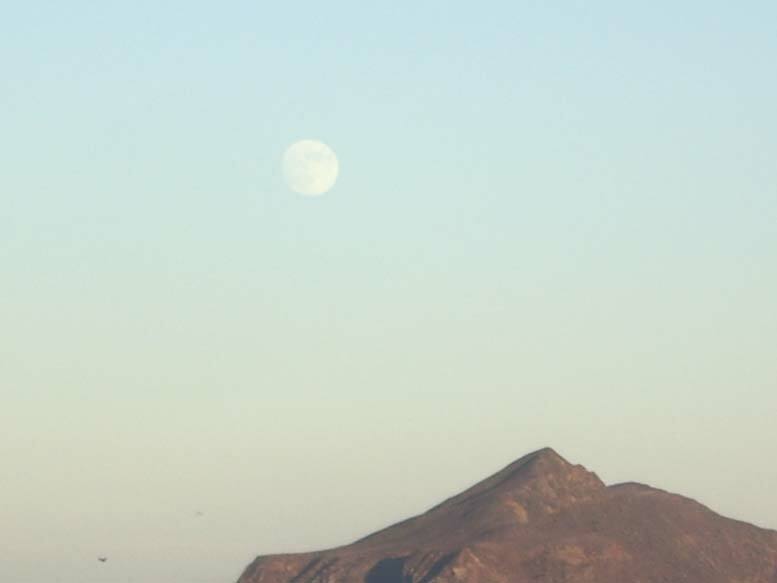 As we arrived at the experiment location, the sun was setting and a most beautiful full moon was rising over a distant horizon. Divers were used to strategically deploy the models to simulate populations of wild fish. The ROV was deployed and ran the line of fish models while video capturing the images. Tonight I had an opportunity to pilot the ROV. I thoroughly enjoyed this opportunity and spent some time observing some flat fish scurrying about the bottom as I waited for the divers to collect the fish models. Soon all was complete, the divers came back on board, and we recovered the ROV safely. We remained at this location for the night, it was quite beautiful. Today was a public relations day. 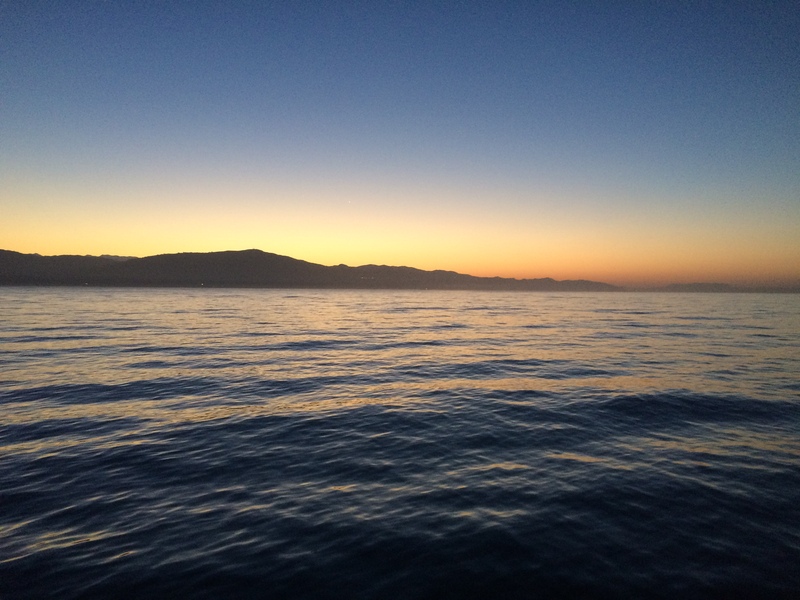 We returned to Anacapa and met up with the California Dept. of Fish and Game boat, the R/V Garibaldi. They had brought some local writers and reporters out to cover the project. We still went on with the normal operations of surveying fish populations. It was another great day on board the NOAA R/V Shearwater as a participant in the Teacher at Sea Program! Back to Santa Barbara we cruised.